Note: Retail margins include taxes. Republished April 13, 2017, at 11:30 a.m. to clarify the estimates of household gasoline expenditures from the Bureau of Labor Statistics. Drivers in the United States will pay an average of $2.46 per gallon (gal) this summer for regular gasoline, according to forecasts in EIA’s Short-Term Energy Outlook (STEO). Gasoline prices from April through September are expected to be 23 cents/gal higher than the average price last summer, but this price is still nearly 70 cents/gal below the previous five-year average. The gasoline price increase this summer primarily reflects slightly higher forecast crude oil prices. 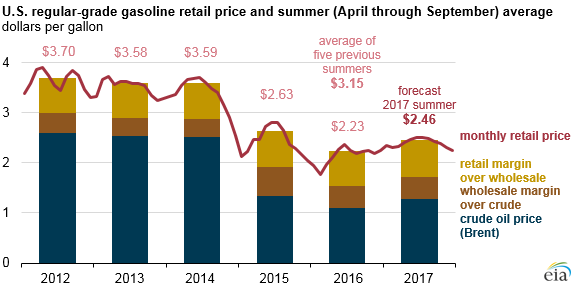 EIA forecasts U.S. regular gasoline prices to average $2.39/gal over the full year of 2017. Based on the Bureau of Labor Statistics’ Consumer Expenditure Survey's latest estimates for average U.S. household expenditures on gasoline and anticipated gasoline price changes, EIA estimates the average household will spend about $200 more on gasoline in 2017 than in 2016, when gasoline prices were the lowest since 2004. Gasoline prices reflect four main components: crude oil prices, wholesale margins, retail distribution costs, and taxes. Because the latter two are generally stable, movements in gasoline prices are primarily the result of changes in crude oil prices and wholesale margins. Each dollar per barrel of sustained price change in crude oil or gasoline wholesale margins translates into a change of 2.4 cents per gallon in product prices. Gasoline prices in the United States tend to reflect changes in the Brent global oil benchmark price. The Brent crude oil price is forecast to average $54 per barrel (b) (1.29 cents/gal) this summer, about $8/b (20 cents/gal) lower than last summer. Crude oil prices are higher this year because of the market’s expectation that global crude oil balances will begin tightening this year, driven in part by the agreement made in December by the Organization of the Petroleum Exporting Countries (OPEC) to reduce production. EIA expects Brent crude oil prices to remain below $60/b on a monthly average basis through December 2018, the final month of the STEO forecast. Gasoline prices also have a seasonal component and typically increase following the winter months. During the spring and summer, gasoline demand often increases and gasoline specifications change from winter-grade gasoline to spring- and summer-grade gasoline. Because summer-grade gasoline is more costly to manufacture, wholesale gasoline margins typically increase during summer months. Projected motor gasoline consumption for summer 2017 is expected to average 9.5 million barrels per day (b/d), slightly more (0.3%) than last summer, as an expected 1.4% increase in summer highway travel more than offsets a 1.2% increase in fleet-wide fuel efficiency. Regional differences in retail gasoline prices can be significant, and EIA forecasts average summer prices to range from a low of $2.21/gal on the Gulf Coast to $2.87/gal on the West Coast. Prices on the West Coast are often the highest in the country because California requires a blend of gasoline that is relatively costly to produce and some states in the region have relatively high state gasoline tax rates. Gasoline prices in Gulf Coast states are often among the lowest in the country because of relatively low state tax rates and abundant gasoline supplies, as the region is home to about half of U.S. petroleum refining capacity.